Bits of My Own: Back from Oblivion!!! Not that I have actually gone anywhere! Just life getting in the way! Time, since the summer has been just a blur! Although I have been very busy, I don't really seem to have much to show for it. I have been spending a lot of time fixing up my old house. It seems everything needs to be re-painted. Also, I have been trying to finish a part of the attic so I can have a little craft studio. This has proven harder than I thought, not to mention colder than I thought! There is no heat up there, so for now the plans will have to be on hold until spring. I really appreciate all your comments! I am always amazed that anyone out there would care about my little scribblings! I still haven't gotten The Old Aviary framed yet. Soon, hopefully. Atleast I have the frame for it. With so much going on, I picked up a fairly brainless project that I have been working on off and on now for over a year. 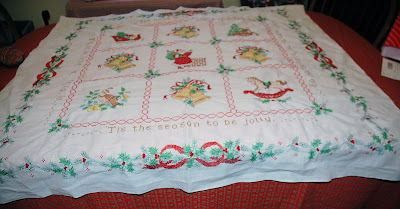 I am happy to say that I have finally finished stitching the little Christmas lap quilt, 'Tis the Season. It's ok, but frankly, I am not sure this one was worth all the work. Maybe I will feel better about it when it is quilted. I hope so. I had some trouble finding the backing fabric for this. Finally I found one the other day on ebay. Of course it will be a while before it is quilted and finished. Oh well. There is always next year! After I finished that, I still wasn't ready to go back to the William Morris design, so I picked up another Cross stitch quilt. I love these old kits, but unfortunately they do take forever! This one is called Country Garden. It didn't come with the thread, so I picked my own. The colors I chose are not as bright as pictured. I wanted a more antique look, so I went for some muted tones. This is a a king-sized quilt, and is a huge design ! I started working on the center panel. The part between the borders hangs down at the bottom of the bed. I have really just started the center design. I guess I have about 2-1/2 feet before I get to the top. Then I have the 2 side panels to do! Well, I guess that is it for the stitching for now. Sorry for such a rambling post. I promise, I will not be gone so long this time! 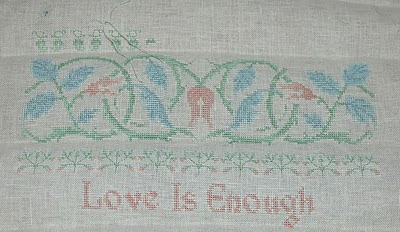 Love is enough is a beautiful design, and you must have been very busy stitching on the cross stitch quilt! Merry Christmas! Country Garden and Love is Enough are both great designs. Such a beautiful selection.I am amazed by the patience you have to draw each pixels delicately by your hands using thread. Wow, Country Garden is a huge projects but you've already mad a nice start on it. I remember this kind of projects when I was little and my grandmother used to stitch table cloths. Congratulations on finishing the stitching on the Christmas lap quilt. Once it's quilted you will be very happy with it.